I love my workspace at home. I had a carpenter from my hometown build me a standing desk to my specifications. It's about 5 feet wide and half of the top of the desk tilts up to 45 degrees to be used as a drawing and painting surface while the other side is stationary for my computer and tablet. It's also got one big drawer underneath that's perfect for storing paper and finished paintings. Being able to stand while I draw and paint has really helped me avoid hunching over as I work, which I have a tendency to do. I recently grabbed a brushed aluminum kitchen cart that, with its wheels locked, is the right height for a standing desk for me. It's been something of a trial run and is working well. 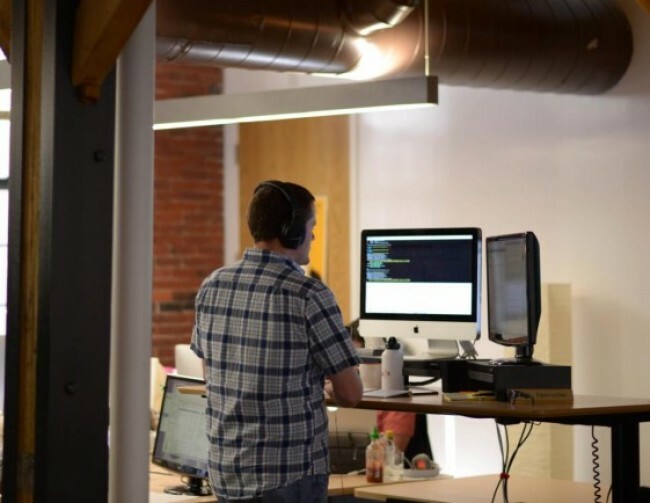 I find myself standing for longer periods of time at the start of the week, and sitting down at the iMac on my desk more frequently as the week progresses. ?I always joke that I could do my work almost anywhere these says! I like a workplace that offers space to move around, I tend to walk about a lot when I'm on the phone. 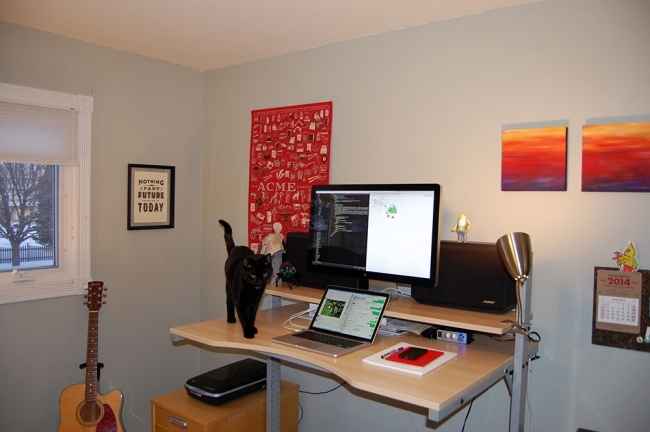 I mainly work from my home office where I switch between a standing desk and sitting desk every couple of hours. I try to force myself to get out of the house as much as I can, be it to a lunch meeting with a local client or spending a day in a co-working space. 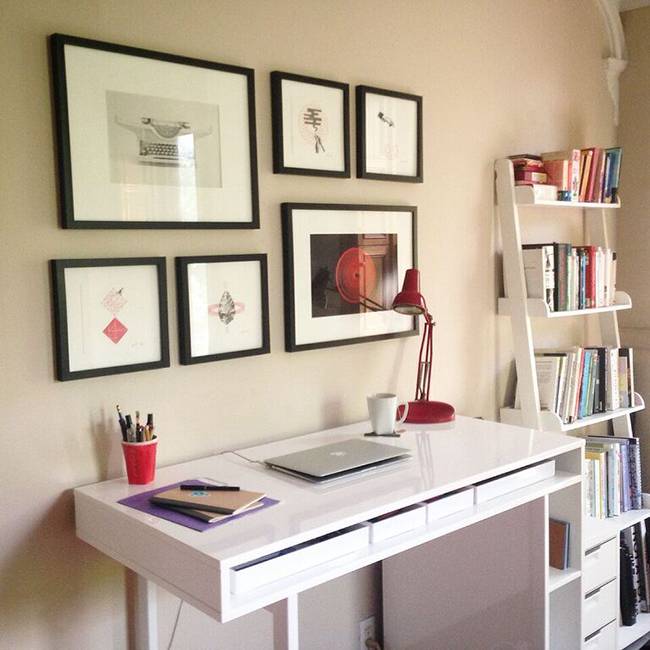 I’ve built the perfect desk — it’s a 2 by 1 meter, 4 cm thick birch board resting on a solid wood legs. 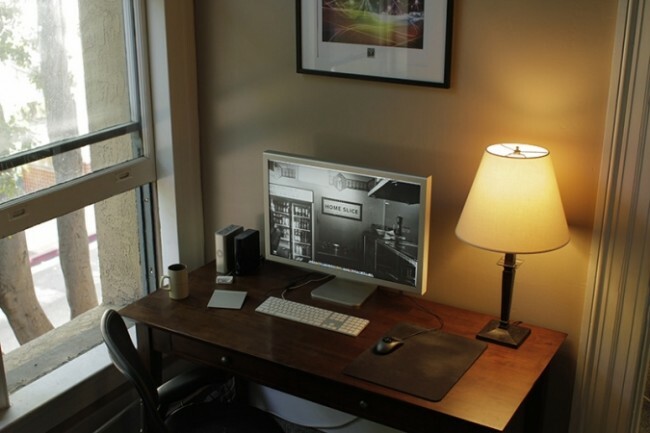 An IKEA Lack table is used as an extension to create a standing desk, in case I want to change my position during long hours behind the computer. For sitting, I rotate a regular office chair and a Varier’s Variable™ balans® chair. For standing, I use a balance board. I live and work all in one space and it works really well for me, but I have to stay well organized. I draw on one side of the room where I have an antique drafting table that is standing height where can I alternate between standing and sitting on a stool. My desk is from Cost Plus, a nice dark wood veneer I'm sure. I'm not a standing desk guy, so I sit my rear in a Aeron chair that I got off Craigstlist during the last dot com bubble burst. They were a dime a dozen back then. I work on a 27” iMac with an external monitor atop a standing desk so I can switch between being seated and standing at any time. My dream setup would have to be configured at home. I would like to try out a standing desk and having three monitors that match. My current desk is a 6 ft Vika desk sitting on two file cabinets. I don't have any room to place my keyboard underneath the desk which would be great to have more room to spread out my projects in front of me. Also monitor arms for a nice big HA! to my cats when they try to block my view. 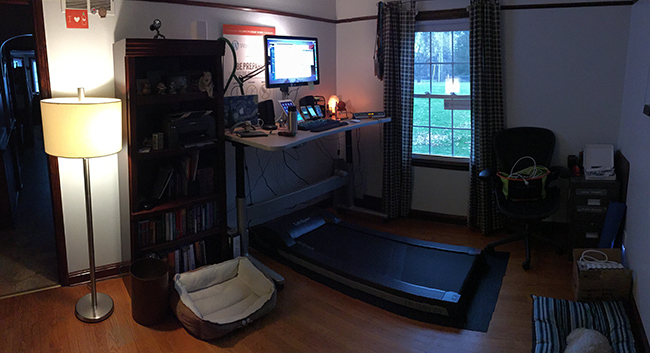 I use a standing desk and a walking treadmill most times during the day. I also enjoy working out on my screened-in porch during warmer months. Space-wise, my apartment is great for getting into a flow: I have a standing desk, a couch, a table, and a rug, so I can work or move however I want. My co-working space (The Townhouse) also has a variety of spaces, and is great for support and surprises. My desk is in “the quiet room”, which is usually focused and peaceful. I also go to coffee houses when I want to be alone in an ambient crowd. My dream setup is an adjustable standing desk from UpDesk for my office so I can stand and then sit part of the time while I work. I really like my setup most days, it’s taken me a while to perfect it. Although, sometimes I wish I had a standing desk like Kelli’s. I like to split my time into two chunks. During work time I like to work from an office with co-workers. I have a standing desk there, which I'm a big fan of, as well as a large external monitor. During my free time I prefer to work with just my laptop, from my couch. I’d like to be able to create zones for the different types of work I do, so a messy area where I could paint and hang canvases and a tidy zone for my mac and design books etc (and a chill out area). I’d like to try a standing desk for my computer work. The ideal scenario would be a studio here in Bristol and one in New York so I could split my time between between the two. I set up a standing desk when I first moved to Gothenburg 18 months ago, and then only used it for videogames and spent most of my time on the couch. That wasn't ideal, so I've gone back to a sitting arrangement with a secondary monitor (a Dell Ultrasharp 2312HM) and a bright orange IKEA MARKUS chair. Well, if we’re ditching cost-value assessments and go straight to the dream, it would be one of the new Mac Pros, with three displays — one vertically in the middle, and two smaller ones on each side. [...] And, of course, an adjustable desk, so that I can switch between sitting and standing with ease. I’ve had one of those at a previous company I worked at, and really appreciated it. My ideal work environment would have lots of light, a standing desk, lots of colour, a bean bag, a dashboard like the Panic Status Board, a big screen Twitter companion app like Dextr, streamed music, and a projector to screen interesting videos and documentaries regularly to which I could invite friends. I think the ideal work environment should include spaces and tools for collaboration. We have actually done a pretty good job at building those out at HubSpot! There are whiteboards and markers everywhere, unbookable rooms where we can have quick meetings as needed, and standing desks whenever we want to move around. 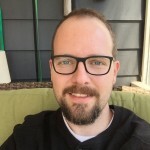 I think my ideal workspace would have a comfy overstuffed chair, a good sitting desk, and a good standing desk — all of them set up with the tools I need and easy for me to switch to and from as the whim or task called for it. My home office is up on our open-plan third floor loft space so this would be easy for me to set up. I just haven't taken the time and effort to do so yet. I don’t really have an ‘ideal’ work environment as I’ve worked in a lot of different spaces. Anywhere with a wifi connection and space to make a bit of mess will work for me but lately I’ve been enjoying working at a standing desk. ...Wherever I can be the most productive. Sometimes that means sitting at my clutter-free desk on a yoga ball with a second monitor. Sometimes that means standing in my kitchen using the bar top as a desk. Sometimes that means a quirky coffee shop. I love working in natural light and without a lot of distractions (we have enough of those online). I tend to move around a lot, getting bored of working in one area for too long. My bar is not as high as some of my peers when it comes to work environments. As long as I have my laptop, power, and an okay Wifi, I can work from anywhere. I use a second monitor at work but I don't depend on it. A standing desk is a nice-to-have. I’d like to give a standing desk a go too, I do worry about the damage of sitting down so much. I’m not fussy. Once I’m sitting down and concentrating my environment doesn’t really come into it, and that’s especially true if I’m wearing headphones. I love being in the world I create when it’s just me and the code. The only thing I don’t have now that I would like to try is a standing desk. We’re a remote company, so my home office is the best. I have a standing desk, a huge second monitor, and a great stereo in there. I stay home, see my kid, and listen to music — surrounded by all the stuff I like. It’s about as ideal as it gets. Sit as little as possible: thanks to a standing desk, and doing walking 1:1 meetings. 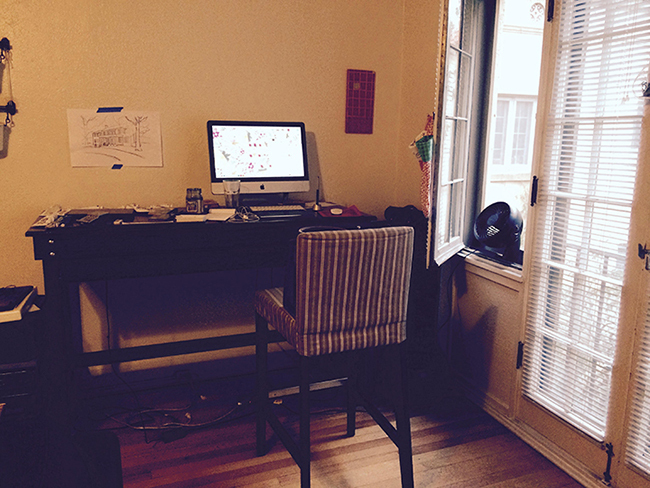 What I loved about working for myself was that I could set up my physical environment exactly how I wanted. Right now I'd love to try a standing desk, a better monitor (we all have to use the same monitors at work) or retina iMac but that's not easy in a big company due to bureaucracy.